The Polyco Teflon Mitt Silver Teflon Heat Resistant Glove is a silver teflon coated mitt, lined with felt fabric offering contact heat protection and a non-stick surface. This heat resistant mitt has been tested to European standard EN 407 Level 2 for contact heat, providing protection up to 250 degrees Celsius. 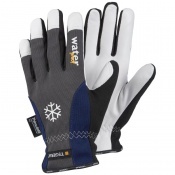 These safety gloves have also been tested in accordance with EN 1186 and are suitable for food contact. The teflon coating on the Polyco Teflon Mitt Silver Teflon Heat Resistant Glove prevents oil and grease being absorbed by the glove and makes them easy to clean. The Polyco Teflon Mitt Silver Teflon Heat Resistant Glove is available with a red and a green cuff which allows for colour coding to prevent contamination when dealing with raw and cooked foods. These benefits ultimately result in a heat resistant glove ideal for use within a food environment with potential heat hazards. The Polyco Teflon Mitt Silver Teflon Heat Resistant Glove also offers good mechanical resistance and has an extra long sleeve which offers the user additional forearm protection. They are also available for purchase in case quantity. Tested to level 2 for contact heat these safety gloves can withstand up to 250 degrees Celsius. 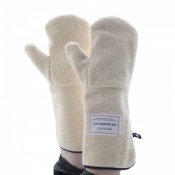 Non-stick teflon coating prevents oil and grease from absorbing into the glove. 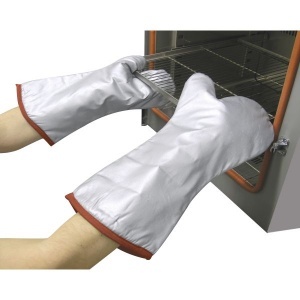 These heat resistant gloves will fit on either hand prolonging the gloves lifespan. An extra long cuff provides additional protection to the forearm. Available in two colours to prevent contamination in kitchen environments. The Polyco Teflon Mitt Silver Teflon Heat Resistant Glove has been tested up to Level 2 for contact heat. 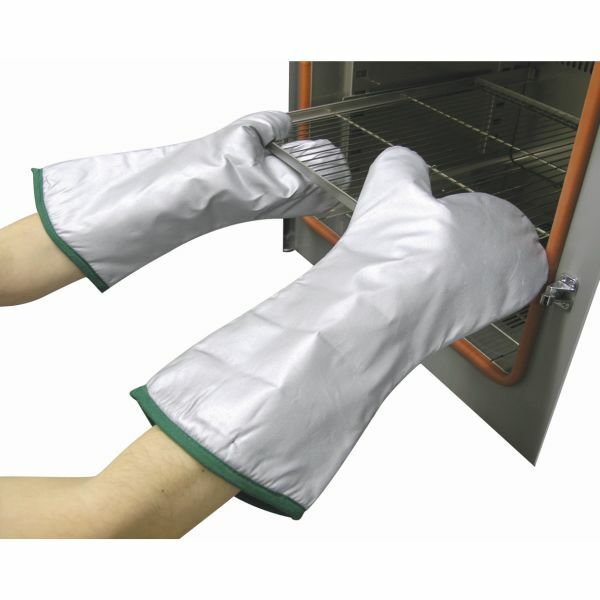 The Polyco Teflon Mitt Silver Teflon Heat Resistant Glove comes in one universal size.